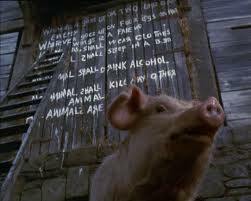 In the novella ,there are many factors which support pigs' totalitarian regime but the most significant one is language. lt's clear that used as the main tool of communication, language not only establishes relationships with others but also it has power to establish regimes and governments. ln the very beginning of the book,reader comes across with the uniting side of language. Old Major, who is a respected animal on the farm, has given a speech to stir the animals' emotion into rebellion. "Man is the only real enemy we have", is the main idea of Old Major's speech and is containing the first sign of propaganda on Animal Farm. His oration inspires and energizes the listeners. He also remembers and sings the song "Beasts of England" and listeners learns it by heart. lt would be sang frequently after the revolution, especially after meetings. The song serves as a propaganda, too. By making the working-class animals speak the same words at the same time, the pigs evoke an atmosphere of grandeur and nobility associated with the recited text's subject matter. The song also erodes the animals'sense of individuality and keeps them focused on the tasks by wich they will purportedly achieve freedom. Seven Commandments are "written on the tarred wall in great white letters that could be read thirty yards away". These are the basic principles of animalism, worked out by the pigs and described originally as "unalterable laws" by which the animals were to live. Seven Commandments are expressing the ideals of animalism and the hopes for a new life by the animals on the farm, besides they are another way of keeping animals under control. The meaning of language can easily be distorted and this point is emphasized in the novel by the help of the characters like Squealer. He and the other pigs have a chance to abuse the language because the animals in the farm are illiterate and the same pigs neglect to educate them as well. When pigs start to claiming the windfall apples, Squealer explains that they are not taking them as privilege but because science has proved that milk and apples are necessary for the pigs' brainwork. "We pigs are brainworkers. The whole management and organisation of the farm depend on us. Day and night, we are watching over your welfare. lt is for your sake that we drink that milk and eat those apples." This is at least satisfies the animals that they are equal to the pigs. 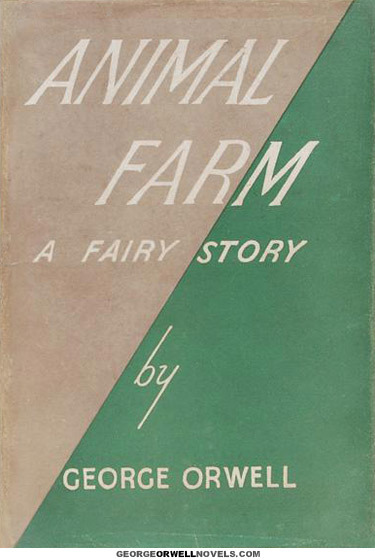 Another example may be Squealer's giving a complete narrative of Boxer's last moments in hospital and is able to quote his last words: "Long live Animal Farm! Long live Comrade Napoleon! Napoleon is always right!" Fortunately,too, he is able to refute the ridiculous rumour that Boxer was sent to the knacker. "The animals were relieved to hear this"
Napoleon, the leader of the farm, abuses language to control others,too. Althought he does not have an active part in the beginning of the revolution he has ultimate power in the end. He uses language and rhetoric to eliminate Snowball,to be able to drink alcohol, kill the animals who rebel against him or live in the house (these are restricted behaviours by the Seven Commandments) He first uses his "right hand man" Squealer and then changes the rules. On the contrary, Snowball obviously has much more brains than Napoleon. He paints the commendments against the end wall of the barn, and when it comes to the battle for Manor Farm and Jones, the farmer who tries to recover his property, it is Snowball that has prepared and drilled the animals for the unexpected attack. lt is Snowball who leads them and who is wounded. As the community developes, it is observed that snowball inspired the "Animal Communities", while Napoleon took no interest in such things. Snowball formed the "Egg Production Committee" for the hens, the "Clean Tails League" for the cows, etc. He never lies to animals, tries to teach them new ideas and believes in revolution. But his direct use of language brings him harm in the end. Propaganda and hypocricy have power to reshape or even to change the most visible truths. A great reformist, Snowball, is made a fallen hero step by step. Squealer works hard to make animals less conscious of what has happened: "He foought bravely at the Battle of the Cowshed" said somebody; "Bravery is not enough" was the answer. "Loyalty and obedience are more important. And as to the Battle of Cowshed, l believe the time willl come when we shall find that Snowball's part in it was much exaggerated. Discipline, comrades, iron discipline! That is the watchword for today. One false step, and our enemies would be upon us. Surely,comrades, you do not want Jones back." That is the first step in the legend that Snowball is the source of evil. The legend grows rather quietly with the building up Napoleon as the leader who thought of everything and is the father of the farm. The windmill was of course really Napoleon's own idea, and Snowball had stolen the plans from among Napoleon's papers. When the windmill falls down at the first puff with the wind, Napoleon himself comes forth and snuffs around till he smells Snowball. "Comrades' he said quietly, 'do you know who is responsible for this? Do you know the enemy who has come in the night and overthrown our windmill? Snowball!' he suddenly roared in a voice of thunder" Next spring, it was discovered that Snowball stole the corn, he upset the milk-pails, he broke the eggs, he trampled the seed-beds, he gnawed the bark off the fruit-trees. A typical touch of hypnosis is supplied when "the cows declared unanimously that Snowball crept into their stalls and milked them in their sleep. Napoleon orders a full investigation, and Squealer is able to tell the animals that "Snowball was in league with Jones from the very start! He was Jones's secret agent all the time. lt has all been proved in documents which he left behind him and which we have only just discovered." Squealer mixes the truth with lies to confuse the animals and makes them to think Napoleon was right in banishing Snowball. All these propagandas cause the animals to believe in the idea that Snowball who was the hero of revolution once upon a time, is the greatest enemy now and Napoleon's leadership is acknowledged with the half truths which are told to them. Napoleon only does what best suits himself and he basically changes all of the commandments with a few words. When he and the other pigs start to stay in the farm house and sleep in the beds he only adds the words "with sheet" to the commandment which is originally "No animal shall sleep in bed" or after the three hens are slaughtered because of the attempted rebellion another commandment is changed "No animal shall kill any other animal without couse" . ln addition to these the ban of human qualities and the basis of "four legs good, two legs bad" transforms into "four legs good, two legs better". ln the end, the commandments reduce to one single sentence "All animals are equal but some animals are more equal than the others" which is obviously demonstrates that using language on behalf of rulers enables society to believe in what they hear and abey what they are told to. Orwell conveys his point of view that hypocricy in addition to propaganda keeps people silent and language has power to control society, with his novella "Animal Farm".